When was the last time you checked your Solar Power inverter? How long would it take for you to notice, there is an issue with your Solar Power Investment? 1 week? 4 weeks? 2 months? Valuable time, that is costing you money, while your Solar inverter is not generating the investment, you originally wanted it to! Our research has shown that many householders, are not checking their Solar inverter on a frequent basis. In the last month we have come across, households with solar inverters tripped off due to lightning strikes and solar inverters with electrical issues. 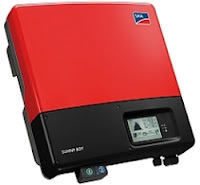 Importantly solar inverters that are not creating any income at all! Of course some of you may be thinking if that was me, I would at least become aware when the electricity bills arrives. What happens though if you are to busy to analyse the bill? You may pass the electricity bill to someone else to pay. You may see some generated power and think everything is fine. Do you know the expected kW generated per bill, per season, by your Solar PV System? We would think you do not! So what can you do to maximise your Solar PV investment? Well you could install a SOLAR POWER MONITORING SYSTEM. This will allow you to keep an eye on the output of your Solar inverter, 24 hours a day. Importantly a Solar PV Monitor will further allow you to educate yourself, about your solar inverter's output, during changes in the weather and seasons. This knowledge assisting you in minimising any waste and balancing out your imported electricity and exported electricity, when connected with NET metering. Sounds all too easy, but this simple solution is often missed! Costing many Aussie householders big dollars. Do you want to find out in three months time about a problem with your solar system? Of course not, so add a SOLAR PV MONITORING SOLUTION tomorrow and protect your solar power investment. Due to a increasing number of householders not being aware of solar inverter malfunctions, we now have easy choices for online and computer based electricity and solar monitoring solutions. To learn more about the monitoring and analysis of your electricity usage and solar pv system's output, visit our CHOOSING YOUR ELECTRICITY MONITOR page, where we make the task of getting your data online, very easy.